Big bass honors went to Blaine Pickavet with a 4.81 largemouth. Thanks to Jeff Cox as Tournament Director, Jon Jezerski, Matt Belletini, Charles Reault, Chris Standhardt and Mark Goetsch for helping run the tournament. 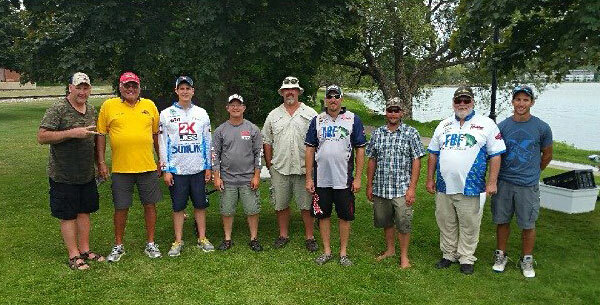 2015 TBF of Michigan state team include (L-R) Jon Jezierski, Bob Evans, Tyler Jaskewiecz, Don Watts, Bret Sall, Rick Roberts, Jay Shaffer, Dave Reault and Kyle Boe.